When a four-year-old leaves school in May thinking she will return the following autumn, you'll find her little heart a bit broken when she realizes she may never see those friends after she moves away. This is exactly why we had to throw a bright bash for Caroline's next adventure! 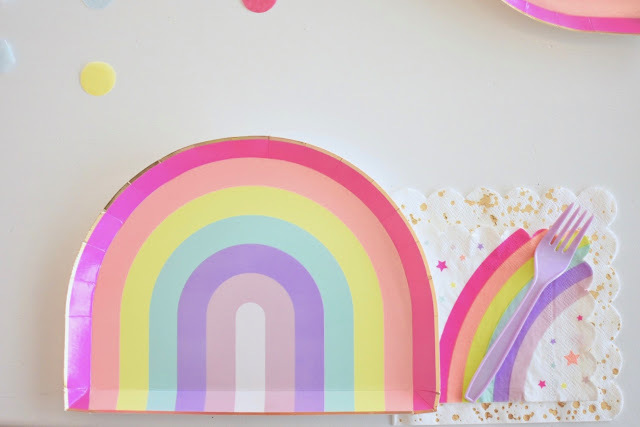 These Paperboy Rainbow plates and coordinating napkins were the perfect starting place, they are so unique and colorful! 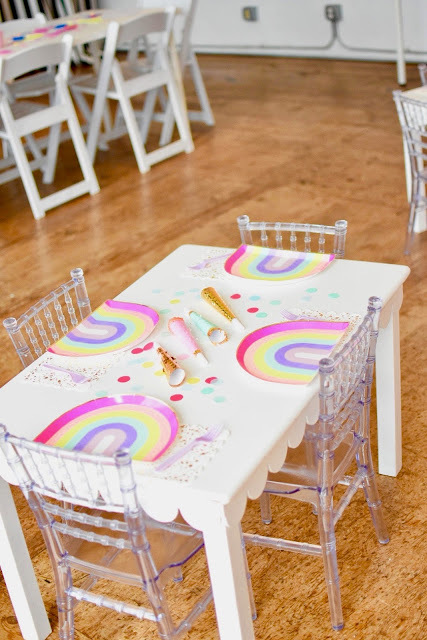 For the guests, we provided popcorn, popsicles, art projects and bright pops of color. 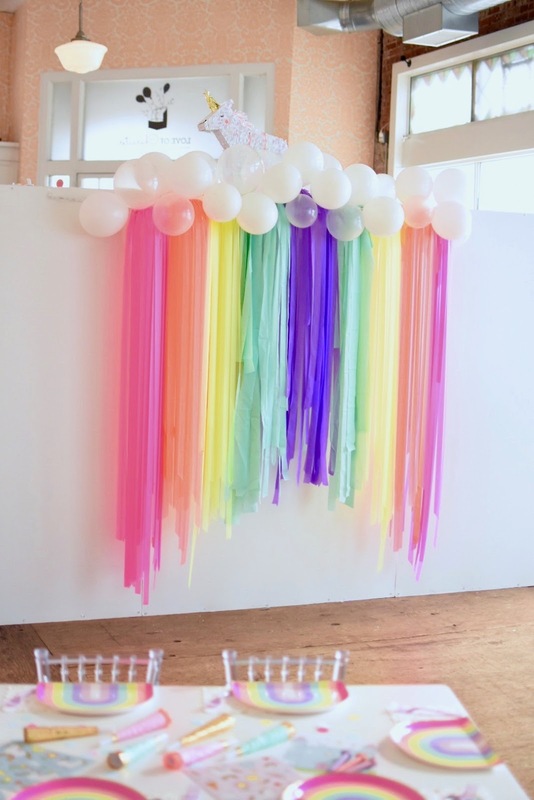 We put together this backdrop using streamers hanging from a loom and when the party is over, it doubles as room decor! To pull the art theme into the party decor, we mixed Paperboy Rainbow Napkins with Meri Meri Gold Splatter Napkins because they are reminiscent of a messy paint session. 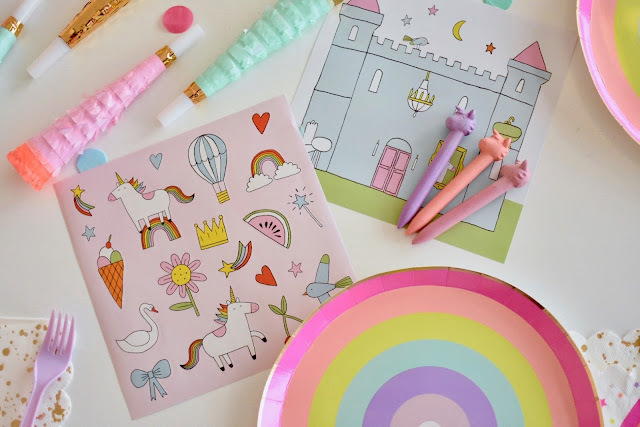 Activities included Magic Maisy sticker pages, Magic Maisy Unicorn Crayons (both from the shop!) and a table full of build-your-own foam glasses. 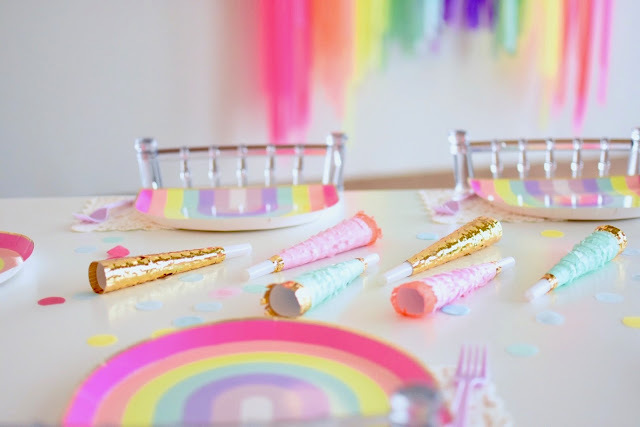 Meri Meri Party Horns were the perfect addition to the table, they are so bright and fun! We have some new, exciting and affordable party favor options and activity kits at the shop. 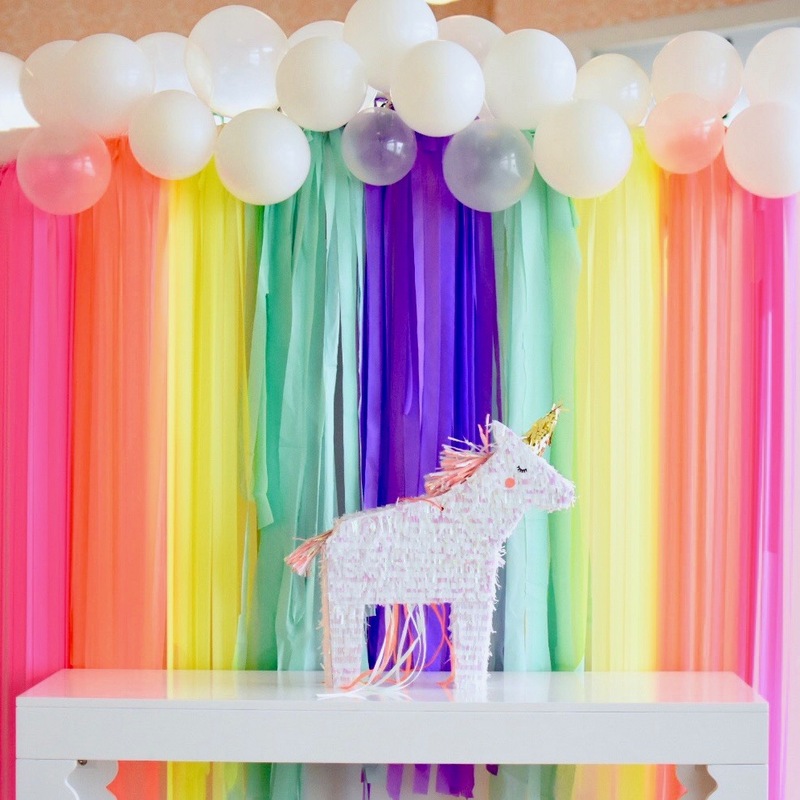 Plus, our dress up closets are a perennial favorite and always free to use for your party! We couldn't resist adding our new Meri Meri Unicorn Piñata into the mix with this fun backdrop! The pull-strings release the treats inside. 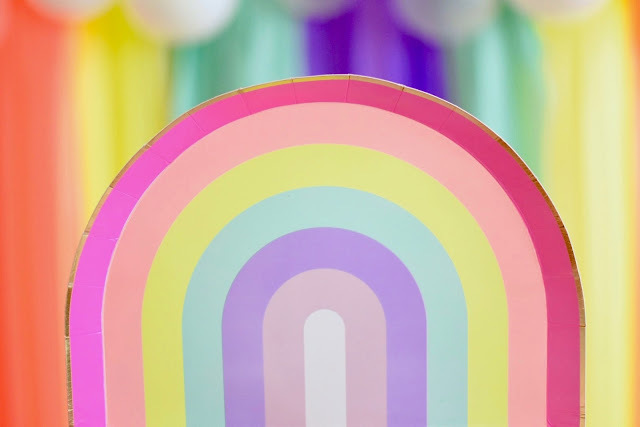 We hope you love this bright and fun party as much as we do! 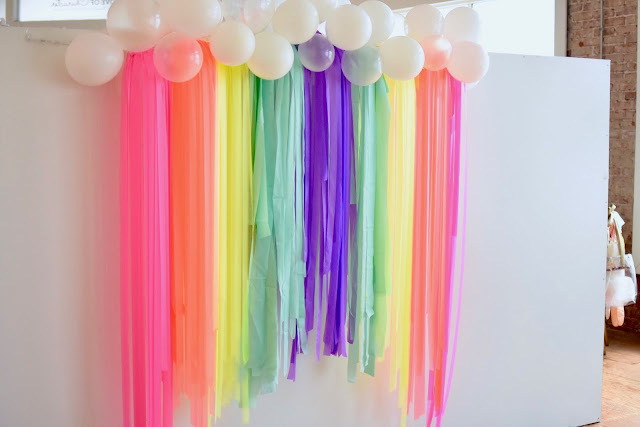 Let us put together some balloons and garlands and streamers for your next event! On a personal note, thank you, LOC supporters, so much for letting me share, plan, decorate and participate in your parties, gifts and life. I've loved every single minute!